GuessWho, starman69 and skyefalcon6 like this. Which is why tempting as it may be, I try to avoid using NATO straps on a WARSAW PACT watch no matter how good it looks. So what does a WARSAW strap look like? Here's my newly acquired Komandirskie, I've got a black NATO on the way from Nato Strap Co. so hopefully I can swap out this, serviceable, but lackluster strap. They must have used something similar, maybe Zulu looking? Makes me wish that the Warsaw Pact had their own look-alike version of the NATO strap. A quick Google search seems to show Bund-looking straps to be the preferred (more authentic?) 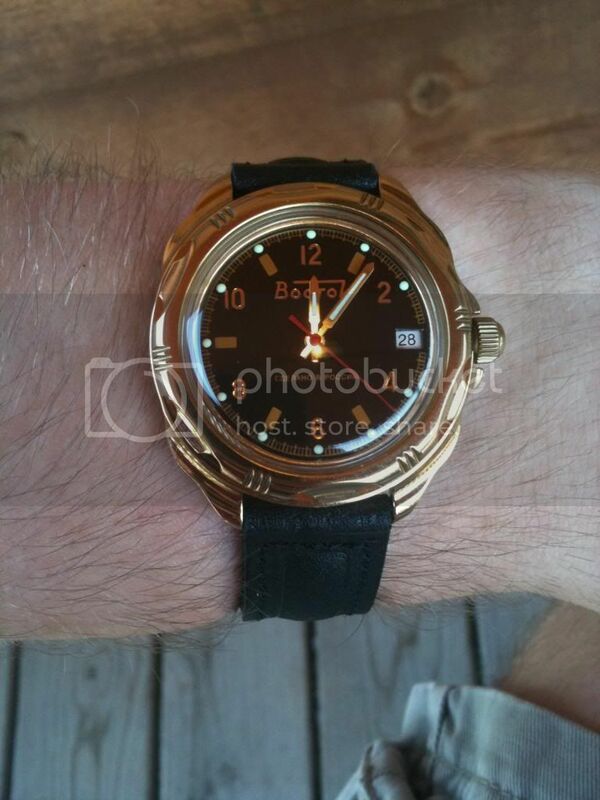 choice for Russian military watches. But in the end, to each his own I guess. Last edited by Tsarli; June 29th, 2013 at 00:23. Last edited by starman69; July 7th, 2013 at 22:09. Is it Rising Star or Rising Sun or both? mp34me, Tsarli, sq100 and 2 others like this. How do you find a NATO Strap in a "Russian Flag" style? 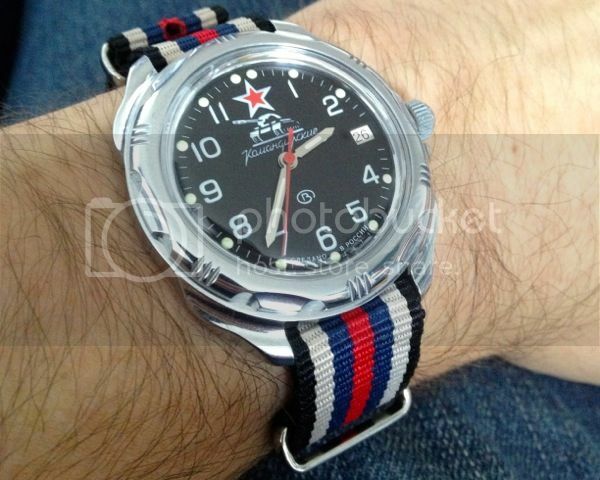 I would think a NATO Strap in the style of the russian flag would look cool on Russian watches! As it seems, a NATO Strap has done justice into making my lovely #431186 Komandirskie look and feel much better. Sure the affiliation of origins of the strap and watch seems ludicrous to pair together. but Differences aside, doesnt the pair look so compatible? On Brown, This combo looks good depending on what im really wearing actually, Green polo shirt and khaki makes this watch/strap combo seem fitting. Had the dial be white, then it would possibly make a big style difference, i like donning the Brown strap more than the black, it looks different and eye-catching, and i like Different (and eye catching).